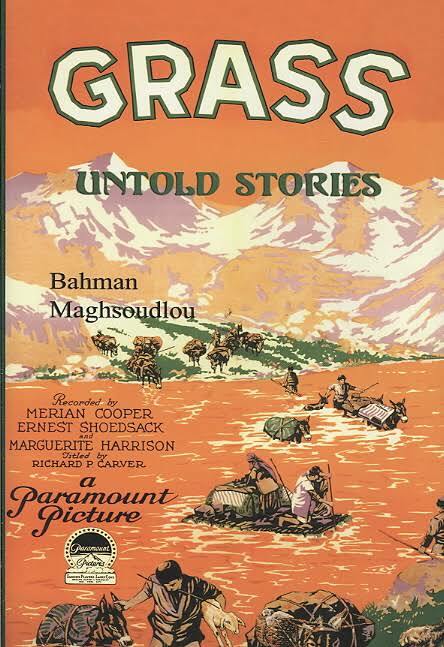 Cooper and Schoedsack, an army cameraman had previously made a film on Ras Tafari (also known as Haile Selassie) and “Grass” became their next project which was in part funded by Harrison. Shoedsack did not like that Cooper allowed Harrison on the trip but Bahman Maghsoudlou finds her an extraordinary person, a woman who inspired the character of Anne Darrow in King Kong from 1933 played by Faye Wray. Harrison is often seen mounted on a donkey being led by a Persian, dressed in Western clothing and often posing for the camera. Cooper and Shoedsack remained behind the scenes in film that was physically exhausting and moved through difficult terrain. The biography of the making of the film and its makers goes into great detail about each of these historical figures and is based largely on the writings of Harrison, the only one to keep an extensive written record of the film which she chronicles in There’s Always Tomorrow from 1938. Segments of Maghsoudlou's book is based on her memoirs. Shoedsack left no memoirs but Cooper was working on his autobiography I’m King Kong, which is now part of the DVD box set of the King Kong films released in 2005. It is co-directed by Kevin Brownlow with archival footage of Cooper, Shoedsack and Harrison. Merian Cooper has said that he wanted to make a film like Nanook of the North (Robert Flaherty) though was unaware of that film until after he returned from Persia, which was what Iran was called until 1938 when Reza Shah Pahlavi changed the name. Pahlavi was a progressive head of state that allowed women to act in films and lifted restrictions on wearing the hijab. The film premiered in March 1925 and the wording of the advertisement in New York World sounds like some of the dialogue in Kong for example the buildup of the area in Persia where the film is set : "the blood red sun withered the grass – seared the souls of 50,000 people and half a million beasts and –we started our epic". Here now is Dr Bahman Maghsoudlou speaking about his book Grass: Untold Stories (interview follows the report).